In the gospel reading, Jesus has been speaking to his followers about faith in the face of persecution, when he is interrupted by a newcomer seeking help with an inheritance. This seems to change the subject completely, but Jesus carefully steers the conversation back to that of faith in God before all else, instructing not to put our trust in possessions but in God. It is not that having possessions is something to be avoided, but rather our attitude to having them and what we do with them. Do we trust in wealth which can easily slip from our fingers or do we put our trust in God, whose love is always with us? But also, of what use is that wealth when it is stored up? Wouldn’t it rather be put to better use storing up what cannot slip away – the good will of others, feeding the hungry, helping the destitute, housing those with no shelter, and supporting our neighbours? Last night I saw the fruits of a community who have maintained patience in the time of trial, and throughout it all have treated their neighbours with kindness and dignity – even when they were subject to vitriolic harassment. 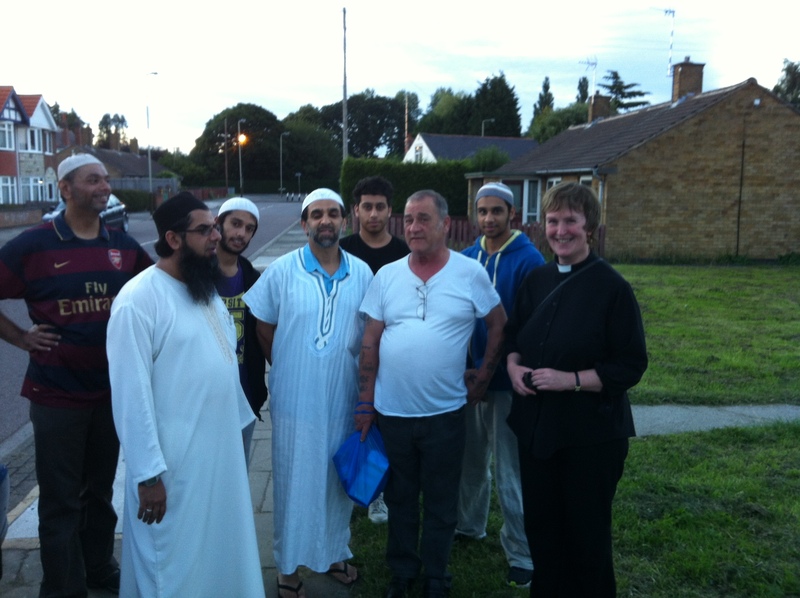 You might recall that last year, about this time, a group of Muslims in Thurnby Lodge estate became the target of harassment from both the BNP and the EDL. Nick Griffin turned up on one occasion, and during the full month of fasting, all during Ramadan groups of so-called protesters would turn up to shout abuse at the Muslims as they gathered to break their fast and pray at the community centre. This continued all through the autumn, with children turning up for after school activities having the run the gauntlet of abuse as they left the building. All of this culminated on Boxing Day with a pig’s head being left outside the door of the centre when they arrived for prayers in the morning. But throughout it all the Muslim community bore the abuse with patience, their imam reining in the hot-headed young men. On Eid they distributed food parcels to elderly poor living on their own and a number of us accompanied them alongside police constables as they did this, and Don Smith, our church warden at the time, accompanied me on this occasion. The parcels were sometimes received with sceptical puzzlement, but most were pleasantly surprised. During the worst of the snows, the men would go and shovel the walks of those who were elderly or infirm. Small acts of kindness built up. Individuals across the estate came to their aid and support, fed up with a small group of hooligans disturbing the peace of their neighbourhoods. And through it all, a renewed commitment to their community centres, a new sense of what it is to be community together gradually grew. So last night I was invited to break fast with this Muslim community, as-Salaam, at their new Peace Centre. They showed us around, talking about what they have done to fix up the building and about their plans for the future. The imam, Maulana Lockhat then gave his nightly sermon – which was really very good! My colleague said he’d make a good parish priest, and maybe that is what he already is in some ways. There was congregational prayer for the Muslims, and then we all shared a sumptuous meal together. And who was there? There were so many members of the surrounding community, invited as people who had supported them over this past year – there was a gaggle of elderly ladies, obviously old friends, who were just no longer ready to keep putting up with the nonsense of the protesters, the chair of the tenants association and other community volunteers. And there were men from the estate too, community leaders and a few burly tough men, teasing the ladies and enjoying all the wonderful food. What a difference from last year. Rather than the hatred and venom being spat out as they went to break their fast, there was a genuine warmth and joining together of community. This comes of a strength of faith, of a patience, that trusts in God, of a community willing to spend of all they have to make life better for everyone. One member of the Muslim community came up to speak to us. He has a doctor’s surgery in Evington, and told us about how they are now they have raised enough money, through donations, they are close to setting up a Fairshare project in the Peace Centre. The ladies group which last year broke up because they were too afraid to gather anymore, now have weekly rather than monthly meetings, and are joined by non-Muslims too. And in their eventual sorrow and grief, the people of Israel do turn to God, and are received with unconditional loving-kindness. When we treat one another the same way, we don’t always get it in return – but there are times when we do. The path isn’t always easy, and it certainly hasn’t been in Thurnby Lodge, but patience has borne its fruit. And I think this is the purpose of the pairing of these two readings. Our possessions do not provide security in themselves. Holding on to things do not give life. But sharing with those less well off, sharing with our neighbours, labouring with patience to build community, and faith in God to provide – these are what bring security. And there are some who give everything they have for those they love, for their neighbours and for God. I just heard late last night that Fr Paolo, the abbot of the monastery in Syria you will have read about in our parish magazine and will have heard me speak of, was forced to leave Syria over a year ago. But he has been returning to Syria for short trips, it is believed to negotiate release of hostages, and has now disappeared himself, suspected kidnapped. No one knows for certain. But whatever the purpose of his return it was because he could no longer bear to be parted from a people and a country he loved. Fr Paolo has not only spent of his possessions, he is spending of his very life. Those who have known and loved him, are praying for him now, praying that he keep his wits about him, and that the cords of love which have bound him to the people of Syria and his faith in God, will protect him now.